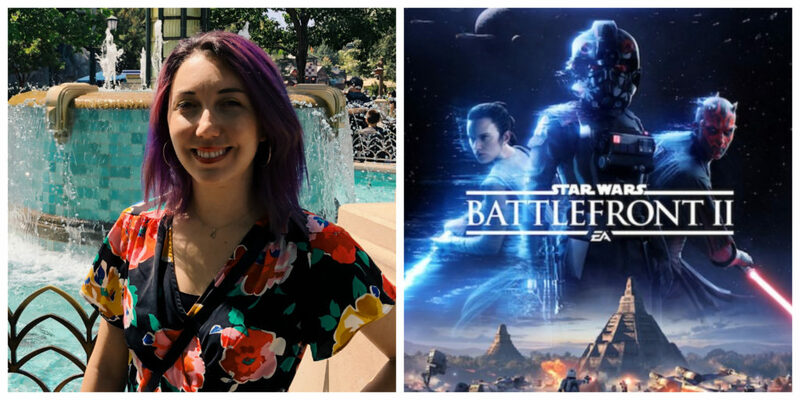 Michelle Halevi is the Brand QA Lead on the Lucasfilm Games team. She answered a few questions via email with 365 Days of Star Wars Women for this interview. Like many kids in my generation, I was introduced to the films by my parents at a very early age along with a large amount of sci-fi and fantasy stories (The Hobbit, X-Files, Back to the Future, Star Trek The Next Generation, and many more). I was also able to see the Prequels in theaters as a kid, which is how I fell in love with the universe. Seeing Padmé as a young, independent, intelligent, and powerful character who was also a Queen that cared for her people, but who had this innate strength and passion, was really inspirational. Can you share your favorite film, time period, or characters from the galaxy far, far away? I could go on forever about this topic! I think that deep down A New Hope is my favorite because it’s the first movie I saw. However, Episode I – The Phantom Menace is definitely up there as well, because it was just so significant for me growing into the universe. It’s so hard to pick favorite characters because many of them have been SO meaningful in my upbringing. For me, Padmé, Leia, and Ahsoka will always stand as the three most important figures in the galaxy. They inspired me to be fearless, passionate, unapologetic, and kind. Also, I have to say that Darth Vader will always be my favorite villain of all time. His growth as a character with Ahsoka in The Clone Wars and into Rebels is one of my favorite stories in the Star Wars universe. How did you get into the gaming industry? For the majority of my life, I had no idea that gaming could be a career. That all changed when I attended the Video Game Awards in 2010 as a seatfiller and saw a number of women producers accepting awards for games. This inspired me and so I applied to some QA jobs, eventually landing my first one at 2K Games working on Borderlands 2. What were some of your favorite video games growing up? I grew up a Nintendo kid. From SNES to Nintendo 64, I played most of the classics. But the game that really captured me that still carries on was Zelda: Ocarina of Time. I spent hours riding Epona through Hyrule and fell so in love with the universe. The Zelda series is still my favorite to this day. As I grew older and started playing PC games, I spent the most time playing an early MMORPG (Massive Multiplayer Online Game) called Ragnarok Online. I used to also be heavily involved in League of Legends and competitive gaming and attended esports events, covering them as a journalist. I know it’s hard to pick favorites but do you have an all-time favorite Star Wars video game? Without a doubt, Star Wars Episode I: Racer. It’s silly I know, but I LOVED this on N64 and forced all my friends to play it with me. Some of the most shared posts I have done on 365 Star Wars Women have been posts about female characters that appeared in video games. What are some of your favorite female Star Wars video game characters? Iden Versio from Star Wars: Battlefront II is my favorite female Star Wars game character. I loved the novelization of Inferno Squad from before we meet Iden in the game, which just helped build on the characters and drama. I immediately loved Iden from the first time I read the script for that game. The character is remarkable and Janina Gavankar’s performance was stunning. I look forward to future women’s stories we can tell through video games in a galaxy far, far away. 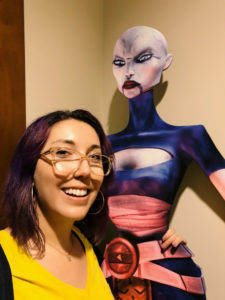 You’re the Brand QA Lead on the Lucasfilm Games Team – can you explain what a Brand QA Lead does and what you might be doing on an average day. 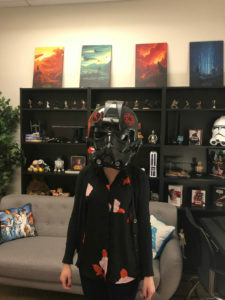 I manage a team of three QA (quality assurance) testers and basically, we work to verify that everything in our Star Wars games are accurate to the brand, high quality, and (at a minimum) working correctly. On an average day, we may be hopping from two to five different builds of games (mobile, console and interactive experiences) and checking the Star Wars content within them against the above criteria. We’re constantly referring back to films and TV shows to check sound effects, visuals, and characterization to make sure nothing is inaccurate. It’s definitely a handful and we’re always busy, but there are few other places where I could apply my passion and knowledge of Star Wars, my love for video games, and be able to work in a collaborative team environment! It’s a rewarding challenge, and I’m thankful to have a great team. I had a summer contract doing some consumer quality control game testing for EA ages ago and when people would say to me “so you just play video games all day?” in my case my answer was “um, pretty much, yes.” Do you get a lot of the same kinds of questions about your job? Do you get the chance to play any of the games you work on as a part of your job? Yes! People typically say that about QA because it’s definitely a role where you have to spend a lot of time in the games themselves. However, I always argue that “playing” a game is really different than “testing” one. When testing a game, you are digging into all the areas of the game and most times following a test plan to execute specific parameters. In our case, testing is really thinking critically about the Star Wars brand and how it interacts with the game, and thinking about all the things in games that affect the overall quality. When I go home after work and really get to jump into games without worrying about finding bugs, inconsistencies in art or text, etc. that is when I truly feel like I am playing, not testing! Was Star Wars: Jedi Challenges the first AR Experience game you worked on? Did your testing process change much on that project than from other console or mobile games? Do you think Lucasfilm Games will have more AR focused items like this games in the future? Yes, it’s the first time I have ever worked in AR! It was definitely a challenge for me because of it being a new platform and experience for players, but when it came down to it, we executed testing for this experience pretty similarly to our non-augmented games. We got the assets from our partners and would check them in-build, providing feedback. It was fun to be a part of something that always fulfilled a fantasy of mine, the lightsaber duels. Do you have a favorite moment from your time at Lucasfilm Games so far? I hate to be cheesy but every single day triumphs the previous day. I’m constantly learning about game development, the Star Wars universe, my team, and about myself. Some of our current in-production projects make me the most excited, and I can’t wait until we can share more about them with the fans! Can you share anything about upcoming Lucasfilm Games projects like Star Wars Jedi: Fallen Order? I am so excited and invigorated by Jedi: Fallen Order, especially since it’s a single-player, action adventure game. It’s so fascinating to see the characters and world of the game come to life in the Star Wars universe within this genre. Please stay tuned for more information on this game, you can sign up for updates on the EA website. Do you have any advice for people wanting to get into the gaming industry (especially women)? Absolutely. I encourage people interested in the gaming industry to focus on expanding two things: things you know, and things you don’t. Become an expert on things you already know, but also keep learning about other areas of the industry. Know your strengths and fuel those, but also use your weaknesses to motivate you to learn more and go outside your comfort zone. Be the change in the gaming industry that we need. Be empathetic. Be caring. Fight for a change in the societal norms and perceptions of gamers. For women, the barrier for entry into the gaming and tech worlds can be the hardest part. If you want to be in this field, you need to know and believe that you BELONG. Turn every challenge into a chance to become stronger and don’t allow anyone to make you feel like you are “other” in this space. I am rooting for you! Also, please take comfort in knowing that there are amazing people and companies in the industry who will uplift, support and cheer for you. I am thankful to work with an amazing team like that here at Lucasfilm.